Brewing beer with Linux, Python, and Raspberry Pi #piday #raspberrypi @Raspberry_Pi « Adafruit Industries – Makers, hackers, artists, designers and engineers! I started brewing my own beer more than 10 years ago. Like most homebrewers, I started in my kitchen making extract-based brews. This required the least equipment and still resulted in really tasty beer. Eventually I stepped up to all-grain brewing using a big cooler for my mash tun. For several years I was brewing 5 gallons at a time, but brewing 10 gallons takes the same amount of time and effort (and only requires slightly larger equipment), so a few years ago I stepped it up. After moving up to 10 gallons, I stumbled across StrangeBrew Elsinore and realized what I really needed to do was convert my whole system to be all-electric, and run it with a Raspberry Pi. There is a ton of great information available for building your own all-electric homebrew system, and most brewers start out at TheElectricBrewery.com. Just putting together the control panel can get pretty complicated, although the simplest approach is outlined well there. 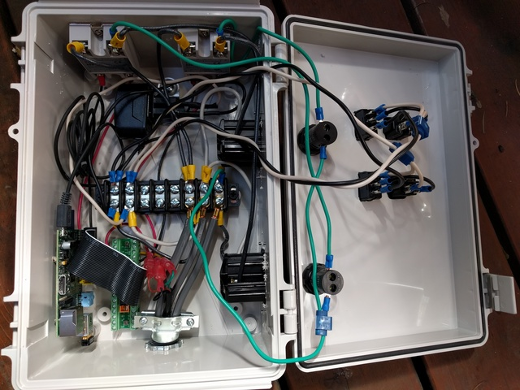 Of course you can also take a less expensive approach and still end up with the same result—a boil kettle and hot liquor tank powered by heating elements and managed by a PID controller. I think that’s a little too boring though (and it also means you don’t get neat graphs of your brew process).